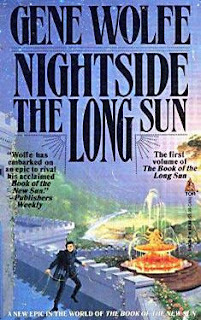 Gene Wolfe has long been considered one of the great writers of science-fiction and fantasy, for his deep, though-provoking works. A few years ago, I tried to read one of his most popular works, Shadow of the Torturer, but gave up about halfway through. His slowly developing plot line, combined with his difficult writing style made the book an unpleasant challenge that did not appeal to me at the time. Well, as I start up my renewed quest to read 100 great books of sci-fi/fantasy, I thought I would give him another try. This decision was made easier when I found a copy of Nightside: The Long Sun in my local library. This book is actually the first in a four book series, but I decided from the outset, that for the moment, I’d only read this one, so I set off. I almost gave up on the book in the first chapter. It opens with a man playing some kind of ballgame, who suddenly receives ‘enlightenment’, that is, in one instant he knows everything, including the will of the gods. It is an incredibly confusing introduction as there is very little to anchor the reader to place or time. Still, I persevered, and the book quickly settled down into a seemingly mundane story about an augur (read: priest to all the gods) attempting to save his school/church from being sold. This leads him into burglary and dealings with shady characters. The prose is enjoyable enough, but again the plot is slow to develop, and at times doesn’t seem to be going anywhere particular. What really kept me reading was the augurs naive, but appealing character, and his relationship with the various gods, especially the mysterious ‘Outsider’. The question to the book isn’t really if the augur will save his church, but who exactly are these gods and what do they want? Unfortunately, you don’t really learn many answers in the book, and the book seems to end on a note nearly as confusing as it began. Did I enjoy the book – yes, mostly. Am I ready to tackle book two? Not even close. I think it is very likely that I will return to this series somewhere down the line, but for now I think it is best if I leave it to rest and marinate in my subconscious. About eight years ago, Games Workshop released their Demon Hunters book for Warhammer 40K, and I knew almost immediately that I had finally found 'my' army. The idea of a select group of hardened, hi-tech warriors, traveling the galaxy, hunting for ancient evil, appealed to me in so many ways. Sure, I discarded half of the 40K backstory which is a bit too dark for me, but otherwise, I was ready to go. Thankfully, at the time, I had a parttime job working in a gaming store that provided me with both extra funds and a discount. 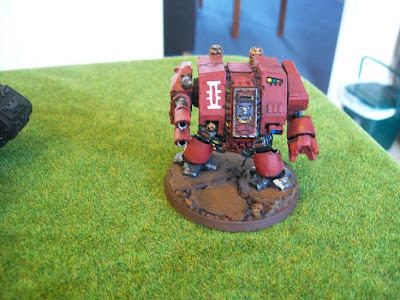 Even then Games Workshop products were pricey. 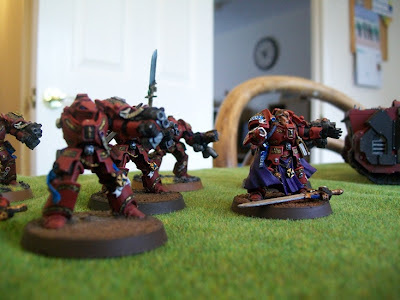 The army would be commanded by Inquisitor Lord Voulgaris, pictured above, a warrior equally comfortable with the sword and with the book. He would search the galaxy from the helm of his ship, the battlecarrier Black Moab. 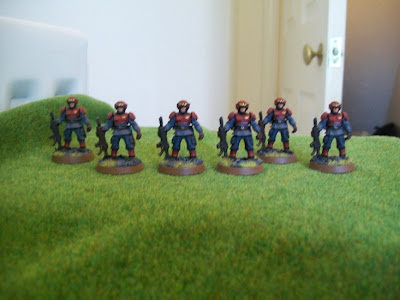 While in D.C., I painted up a small army. I even entered them in one of the store tournaments, where I finished 3rd out of 8. 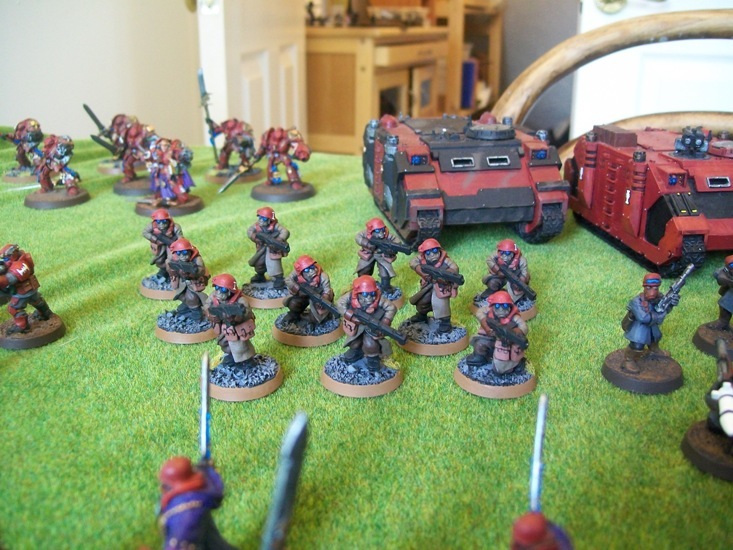 The main fighting element of the army was made up of the stormtroopers of the 109th 'Demon Blade' regiment. However, when I left D.C. for the first time, I packed the army away, ready for my new life in Britain. Well, I realized pretty early on, that my new life still needed to include miniature painting, and so I started the army for a second time. 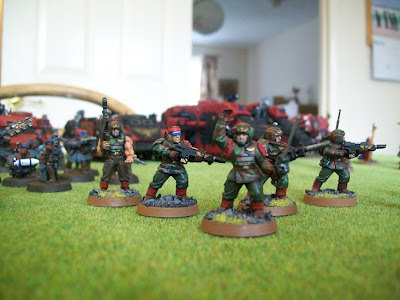 During this time, I switched basing styles, from the very plain blasted terrain of the original army, to the more rocky with bits of green of the new army. For years the two halves of the army never saw one another. In fact, it wasn't until yesterday morning, that all the members of the fighting compliment of the Black Moab stood on the same table together for a photo shoot. ﻿But now I'm a bit at a loss as to what exactly to do with them. 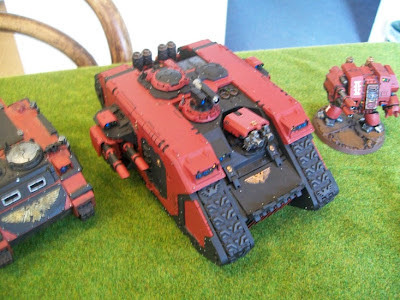 It long ago ceased to be a legal army in 40K terms. 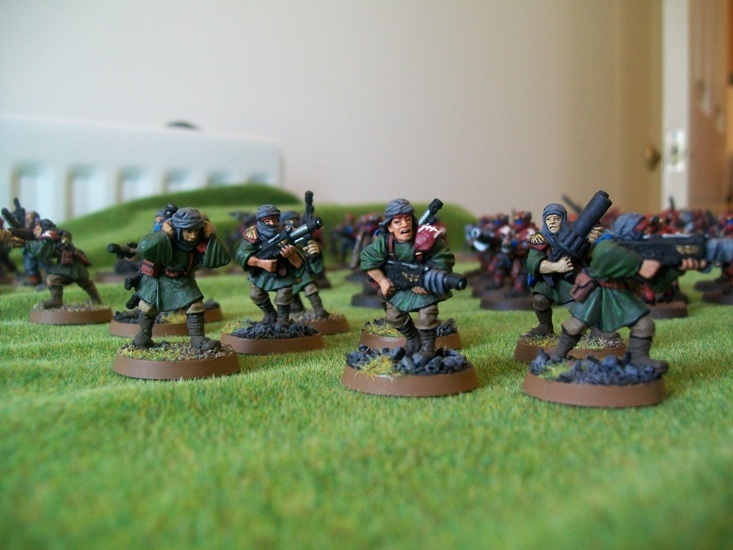 In fact, I'm not sure the Demon Hunters even exist as an army anymore. But that's no matter. 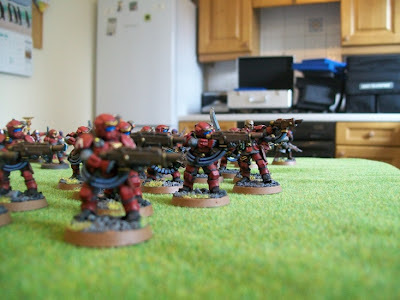 I no longer play with 40K rules. But the whole thing seems a bit unweildy. 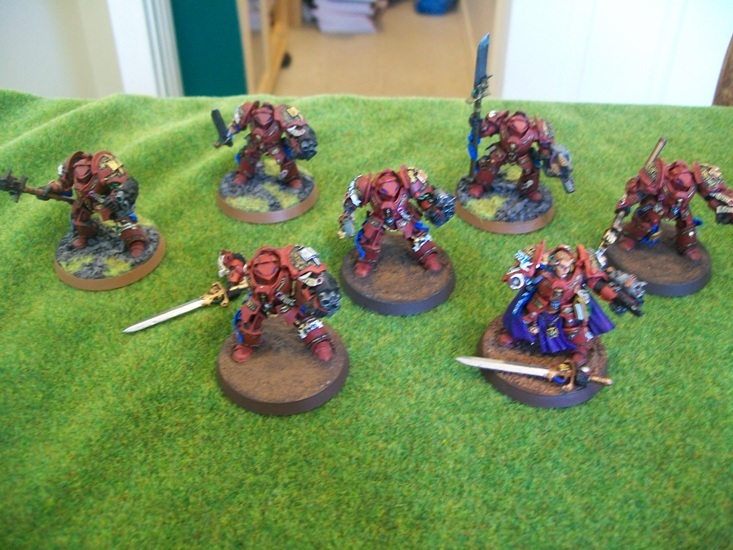 It contains two different basing styles. It has no real structure higher than squad level. Are these things worth worrying about? 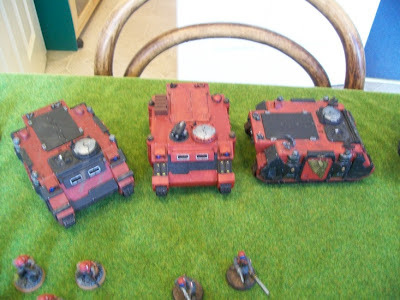 I store the army in a pair of large miniautres cases. 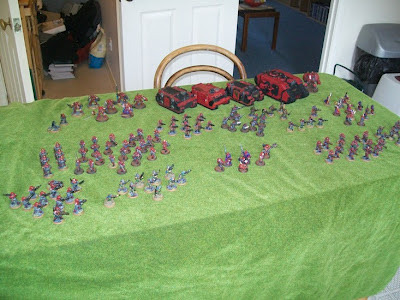 Thus it is very difficult and time consuming to look at the whole army at one time and to think about what to do with it. 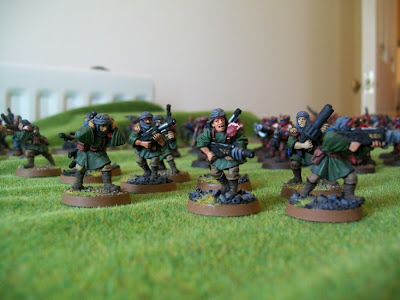 Is it worth rebasing fully half the army to get uniformity? The picture above is a good example of the two different styles. 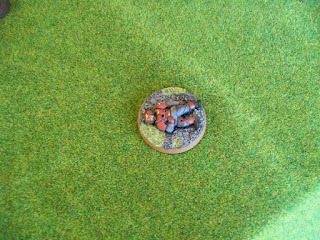 I now recognize the 'blasted earth' one as rather ugly, although it does look less wrong for miniatures fighting indoors. Keeping the army packed away also leads to inevitable breakages. I've never managed to make more than the one casualty marker. 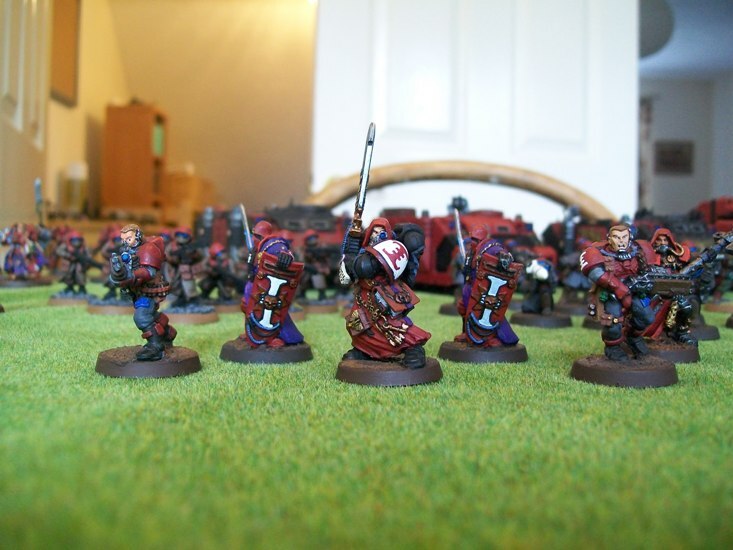 A six man honour guard. Kind of cool, but I'm not sure what he point is, really. 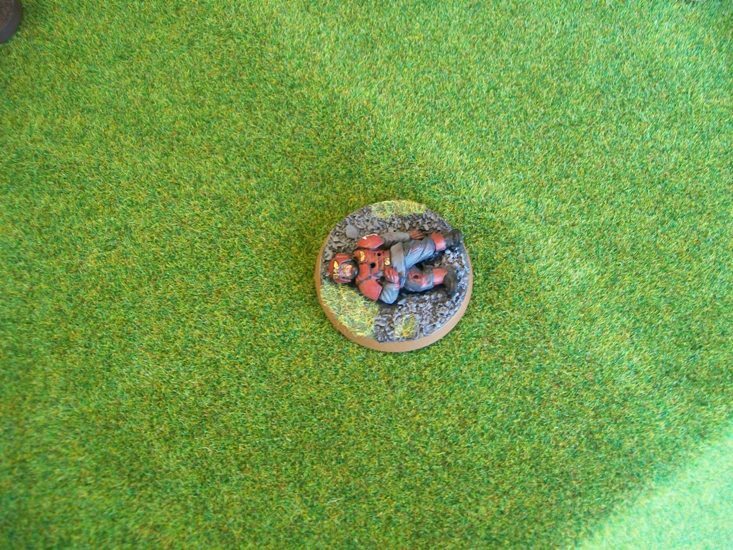 Over the last few years, I’ve notice a disturbing trend in my miniature painting. I seem to be painting faster and faster. I used to take time and delight in each figure, making it the best I could. But lately, I just seem to be slapping paint on figures as quick as possible in order to call the figure ‘done’. 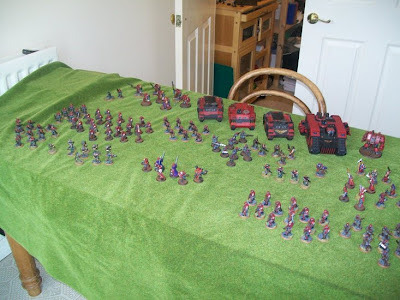 Perhaps this has to do with trying to paint big armies, or maybe it is just the looming presence of my towering lead-pile. Either way, it is not good. Considering I spend the vast majority of my miniature hobby-time painting, it is important that this process be as enjoyable as possible. For me it will always be better to have a few really good looking figures than vast armies of mediocre stuff. Besides, with enough painting, the vast hordes will come. So, armed with this new, if not overly original philosophy, I set about painting an old Games Workshop figure I found on the lead-pile. 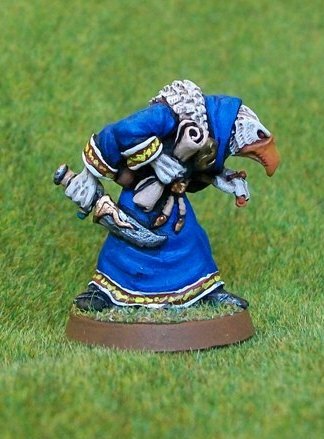 It’s an old Choas Sorceror. Like many old GW figures, it is somewhat flat, but it is heaped with character. I’ve named this evil wizard, Stork Krazer, and he is sure to prove a reoccurring nemesis for my Demon Hunter forces. I am especially proud of the detailing I added around his cuffs and bottom hem, which, I think, really gives the figure a lot more visual appeal. It can also be spelled ‘flite’. The word is normally used to describe the poetic insult-slinging matches that were common in ancient Norse, German, and English society. The Scots would eventually turn the art form into a spectator sport in the 16th Century. Essentially, it is schoolyard taunting taken to its highest poetic level. It should not be confused with ‘a battle of wits’, which traditionally has a much higher degree of subtlety and decorum. The problem was I didn’t enjoy most of the books I was reading. In several cases, I found the topic, or the author’s views, distasteful. Other books I found wearying because of the style of prose. So the project ground to a halt. It’s my own fault, mind you. Most of these books I should have realized I wasn’t going to enjoy just by reading the blurb. But I forced myself to read them out of some misguided sense of intellectual expansion. Now, having had some time to reflect on the experience, I have realized that my intent was a good one, but my methodology was flawed. The only person who can determine if a book is a classic is me (that is to say ‘the individual’). 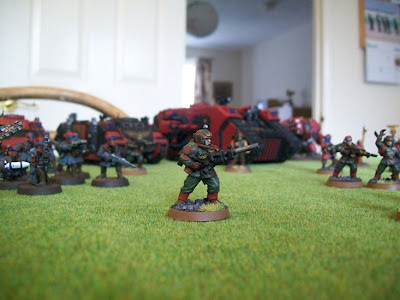 Other people can suggest and even argue, but I am the final, and only important, arbiter. So, I am re-launching my quest to read the 100 greatest books of science-fiction and fantasy. However, this time, it is only after I have read a book that I will know if it is (or is not) on the list. To get myself started, I have made a list of all the books on my shelf that qualify for the title. I have probably read others, but either I have forgotten them, or can’t remember them well enough to know if they qualify. 19 down - 81 to go. 10. 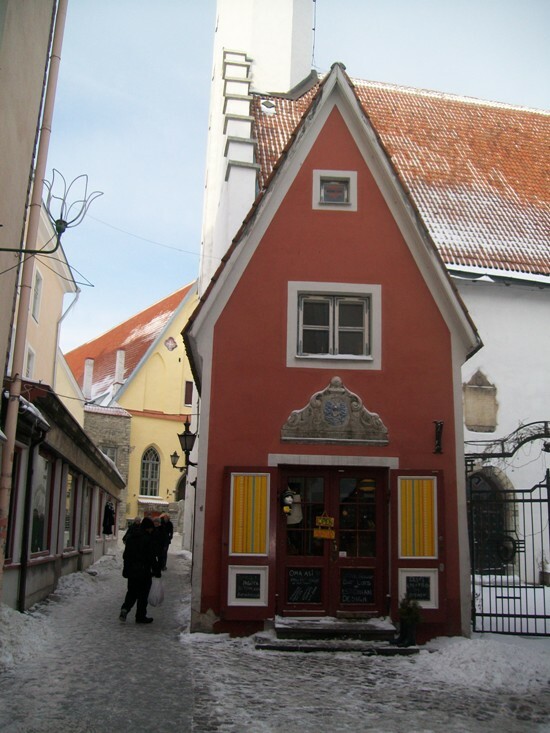 A Canticle for Leibowitz – Walter Miller Jr.
Tallin is truly an amazing little city, but after two days, my wife and I wanted to see a little more of the country. So we signed up to take a day tour out into the country. Actually, our ‘tour’ consisted of us, an Estonian college student/guide and a van. (I’m still trying to figure out how it made economic sense to run this tour, but I’m glad they did). We sped out of town early in the morning, going 40-50 mph on roads that made you grip the dashboard and pray that you were in good standing with the big man upstairs. Our guide told us that all Estonians are required to take an ice-driving course in order to get their license, which only made me feel a little better. Our first stop was at an isolated beach. Well, it was a beach part of the year, now it was hard to tell where the land ended and the sea began. Here you could stand on the frozen ocean, watching the chunks of ice floating free. From there we travelled to where the Soviets used to train their nuclear submariners (and where they’ve buried their training reactors for disposal at a future date) and to an abandoned coastal battery from the 1920s. Normally you can’t enter this as it is usually flooded, but we could walk on the ice through the pitch black ruins. Soon after, we stopped for lunch in the town of Paldiski. It is perhaps a shame that we took no pictures of Paldiski, but it wasn’t the kind of place that made you want to get your camera out. 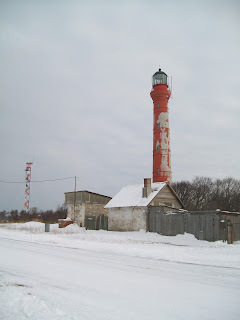 Built as a harbour/shipyard by the Russians, who imported the workforce, the town was one of the ugliest, most depressing places I’ve ever been. Most of the buildings were crumbling, rectangular apartment blocks, neglected and grim. 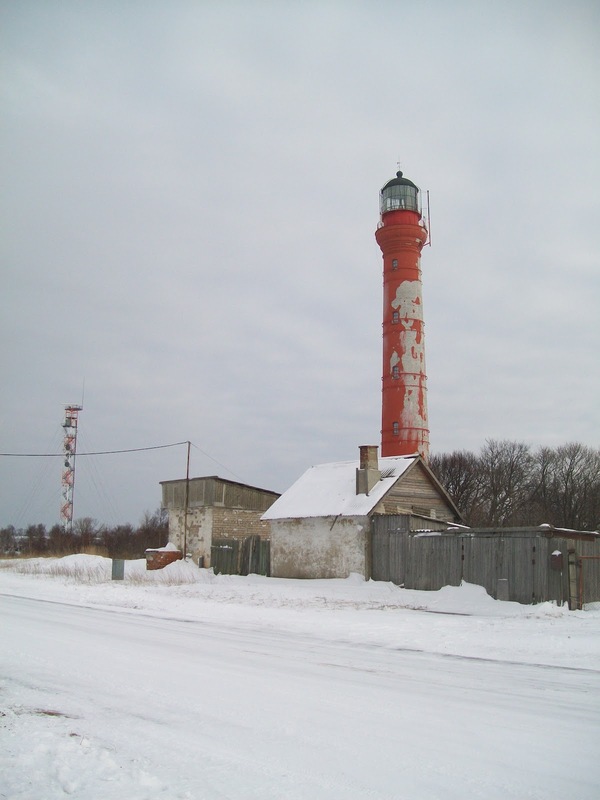 When the Soviets granted Estonia its independence in the early 90s, most of the Russian population of the town decided to remain. We stopped in a tavern, constructed of heavy wooden logs and stone, and ordered a lunch of thick, red soup containing tiny bits of pork and vegetables with a strange sweet and sour flavour. When our host discovered we were tourists, she brought out a photo album of old pictures of the town, which she was selling. I bought one of the harbour which I thought contained a warship (the tavern keeper identified it as the Russian battlecruiser Aurora, which fought against the Japanese in the Russo-Japanese war). The soup was good, and for the first time we heard Russian folk music playing on the radio (as opposed to English/American pop which is most popular in the country). However, our guide became noticeably less chatty and slightly uneasy throughout lunch. With nothing really to see in Paldiski (but richer for the experience) we sped out of town to one of the more memorable sights of our trip, the frozen waterfall. 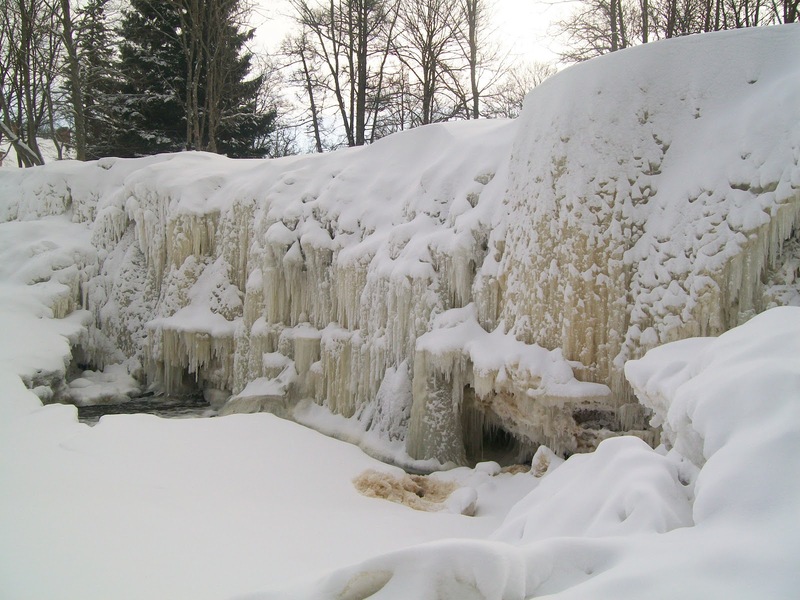 Think about just how cold it has to get to freeze a waterfall some thirty feet wide and twenty feet high. Actually, it wasn’t completely frozen, water was still rushing through underneath the ice and bubbled up in a small pool at the bottom, before running off down a semi-frozen river. At one spot you could actually climb into the waterfall cave, and, of course, we did. 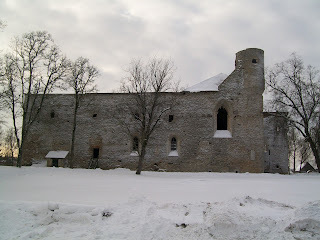 Our next stop was a building that would be a major tourist draw in another country, the ruins of the Padise Monastery. Built between the 12th and 13th century by Cistercian monks it was later seized and militarized during the Livonian war. Although there has been little attempt to make it into a tourist destination, the government has built an access way up to the top of the tower and put roofs over parts of the structure, which are occasionally used for concerts. 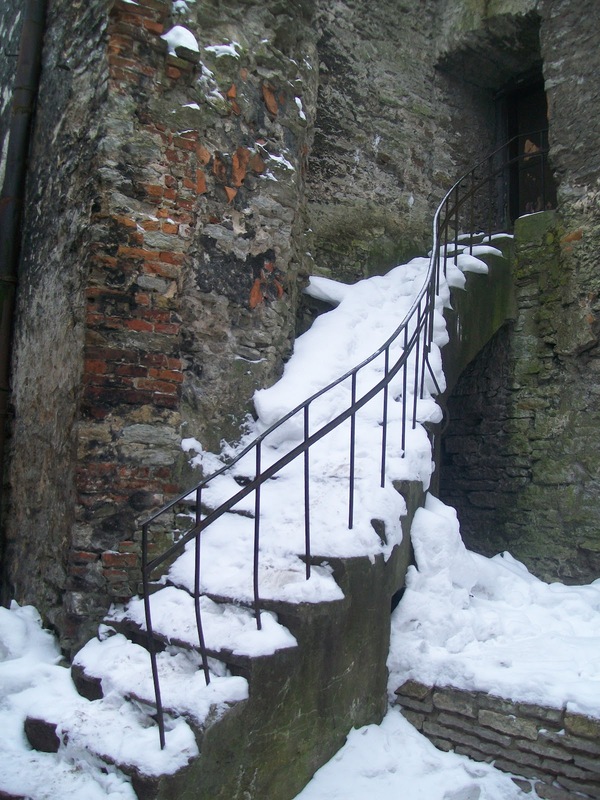 Exploring the ruins means walking through knee high snow, but that just made it more fun! Our last stop on the tour was in a lonely spot by the side of the road. After a short walk through the deep snow of the forest, we came across a strange little graveyard. 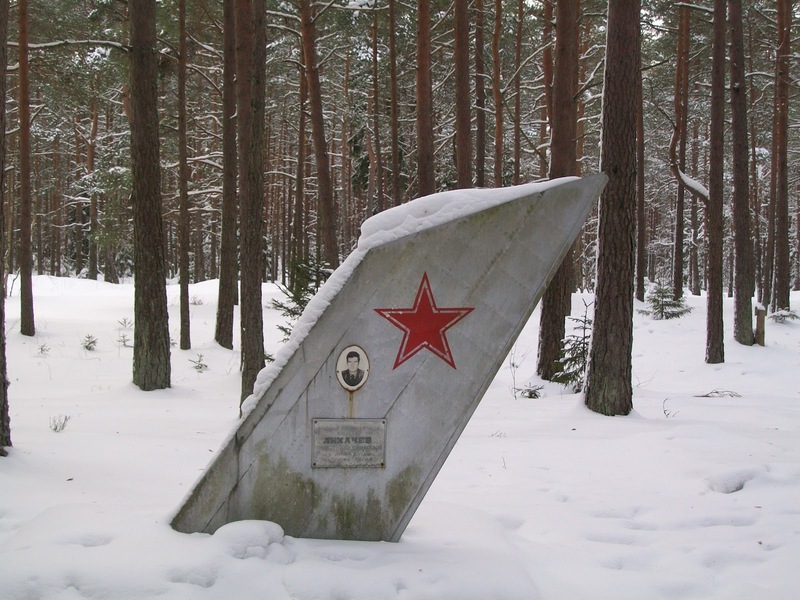 The graveyard had once served the nearby Soviet airbase, and instead of headstones, many of the markers were tails from old MiG fighter jets. The graveyard is now essentially forgotten and only maintained through the effort of locals. We arrived back in Tallinn in the late afternoon, very tired, but glad that we’d gotten to see so much more of this fascinating little country. Our visit to Estonia was never meant to be a long trip, nor a thorough exploration of the country, but as a quick tourist, fact-finding mission, it was a complete success. If I had to advise, I would go against the popular wisdom, and say DO go to Tallinn in the winter. My wife and I both agree that it was the snow and the freezing temperatures that made this trip such a different and interesting experience. Also, it meant that there were no crowds and no lines, almost like we had the city to ourselves. The eastern most of the Baltic States, Estonia has a landmass slightly larger than the Netherlands, but only a fraction of its people. Its 1.3 million residents gives it a population density about the same as the United Sates. Nearly half of the country is undeveloped wilderness. In February, the temperature rarely gets above freezing, and temperatures of -20C are common. However, my wife and I lucked out. The average daytime temperature while we were visiting was -5 and it never dropped below -10 during the day. Okay, it was cold. Really cold, but if you bundled up right, you could stand walking around in it for an hour or so before it was necessary to duck into a shop, museum, restaurant, or cafe, and there were plenty of those to choose from. As a tourist, it was part of the charm. 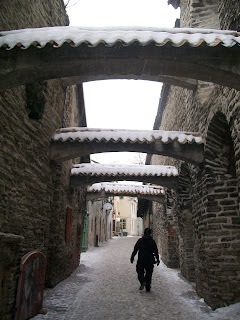 So we wandered the streets of Tallinn in short little bursts, discovering many delightful streets. (Photo 14, 15, 16). 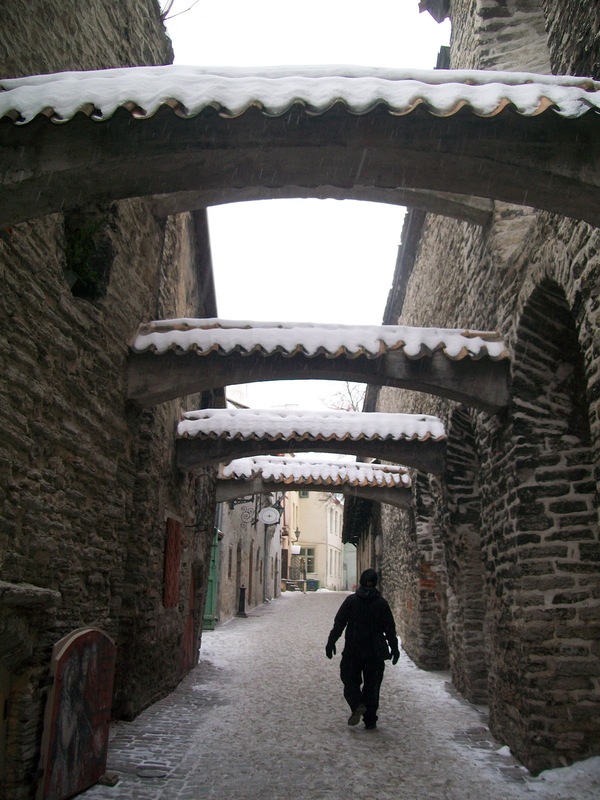 The locals kept all of the walks shovelled and well gritted, but we were still thankful that we had taken the advice to bring our walking boots. Without a doubt, our favourite discovery was in a little courtyard in the ruins of a Benedictine Monastery. Here, in a poorly lit cellar, was the oddly named ‘ICHTHUS’, the artistic studio of Aleksanor Savchenkov. There in the dim, cool, dungeon, Savchenkov sat and painted, with Latin chants playing on the CD player. Most of his artwork depicted scenes from Tallinn, many with religious themes, many of which obviously told stories of angels and medieval times. Unfortunately, his English (nor my Russian) were up to the challenge of complex communication. I checked later, and his studio is mentioned in none of the guidebooks, which is truly a shame, as this man has created his own little world, beautifully out of time. Estonians, as a rule, are trilingual. The official language is Estonian, a Finnish-Hungarian language so difficult that even my wife, who is quite good with languages, had difficulty mastering simple words such as ‘hello’ and ‘thank you’. All Estonians also learn Russian, and fully a third of the population is ethnically Russian. There is still a good bit of tension between the Russian and Estonian populations and most ethnic Estonians will only speak Russian if absolutely necessary. Thankfully, Estonian schools also teach English, and, at least in the tourist areas, they speak it to a high standard. At night, we retreated into one of the many warm and welcoming restraints, many of which sported a medieval theme. While this would probably come across as rather cheesy in England or the USA, it really seemed to fit with the city, and warm candles, mulled wine, spiced beer, and roasted pork all seem very fitting as the snow continued to fall outside.